Thank you!! We look forward to seeing you in the future. Thank you Donna for your lovely review. It was a pleasure seeing you all again and glad you had another relaxing stay. Take care. Thank you for your lovely review and it was a pleasure to accommodate you all. See you dreckly!! We've just returned from a wonderful week at Meadowview Cottage. The Cottage is immaculate - everything is in perfect condition, and the cleanliness is 100%. Debbie was a perfect host - she came out to help the kids feed the animals, and was there to answer any questions, and to make sure that our stay was without hitch. Finally, I managed to leave a journal at the Cottage, and had been hunting for it, hoping it had been tucked away in the car, when I received an email from Debbie to say she had found a journal and would send it to us. It is these little touches that make such a difference. I would say that Debbie will bend over backwards to accommodate her guests, and we are so grateful as it really did make a difference to our holiday. Thank you for your lovely review. It was our pleasure to help keep the children happy. So you all could enjoy a relaxing holiday. We look forward to seeing you all again. Take care. We spent a week in this rather special cottage earlier this month. We have stayed in some really lovely holiday lets over many years, from the far north of Scotland to the tip of Cornwall and numerous points in between. But for us Meadowview really stands out from them all. The cottage itself is spotlessly maintained, very comfy, and generously equipped with everything you could possibly think of (plus some very thoughtful touches) to make your stay a thoroughly enjoyable experience. It has a number of interesting and unique features as well, which have been expertly blended in to maintain a link with the heritage of what was originally a working farm building. The outdoor facilities are a bit special too - there is something for everyone. Debbie and Roger were so friendly and welcoming - nothing was too much trouble for them. It was a real pleasure to meet them and we cannot praise them too highly. The next time we are down this way, Meadowview will be our number one choice - it is first class! Wow A M A Z I N G! This is a long overdue review for the best cottage that we have stayed in in Cornwall. The attention to detail in this beautiful property is second to none. The service provided by Debbie and Rodger is above and beyond what you would expect from hosts: a barbeque which cleans itself (! ), wood and grill provided for marshmallow toasting on the beach, outdoor toys, immaculate gardens. They really have thought of everything and nothing was too much trouble. Thank you. We had a fantastic family holiday in this gorgeous place and cannot recommend it highly enough. We hope to come back. Proper Job! your review is fantastic and it was pleasure to accommodate you all, so glad you had a great holiday staying at Meadowview. See you dreckly my ansomes! We have just returned from our 3rd visit to Meadowview Cottage, it never disappoints! Spotlessly clean, everything you could possibly need, luxurious and so peaceful. From watching the birds at breakfast, to sitting in the private gardens with a glass of wine. There are lots of places to visit nearby, stunning walks and breathtaking views, or if you just want to relax in the cottage there is plenty to keep all members of the family entertained. Roger and Debbie provide a wonderful welcome, first class facilities, and local knowledge to make your stay the best you will experience in this area (why else would we keep coming back). Thank you so much for your lovely review. It was a pleasure to see you and your family for a third time. We look forward to seeing you Dreckly !!!!. Take care. We had a wonderful family holiday in Meadow View cottage. The accommodation is so luxurious we couldn't bear to leave at the end of the week. We would definitely recommend staying here and hope to be back again soon! Thanks Debbie and Roger. Thank you for your kind words, it was a pleasure meeting you all and we are so pleased you enjoyed your stay . Take care and hope to see you Dreckly !. Myself and my wife were at Meadowview Cottage a week ago. We had such a delightful time enjoying the cottage and the generosity and warm hospitality of Debbie and Roger. We promised that when we got home we would write a review that could do justice to how brilliant our stay had been. Having read the previous reviews I find myself at a loss for words. How can I better describe this fantastic holiday home, how can I say more of the welcome that Debbie and Roger gave us. How can I tell you, the future guest, more of the efforts that your hosts will go to to make your stay a most memorable and enjoyable one. You may arrive as strangers but you will leave as friends. As soon as we walked through the gate, we where so impressed with all we could see, and that carried on, the further we got into our tour of the cottage and its surroundings, the more we where excited and pleased to be staying here. You can tell there has been a perfectionist involved in building this beautiful cottage, with every detail in every room. So very clean, from top to bottom. We would have been happy just to stay at the cottage for our entire time, we really felt so relaxed in this peaceful location. Great for kids, our little boy wants us to move there now!, lots to do for them and you can sit back and relax knowing they are safe. We spent a lot of time out in the garden , which has been done to a high standard, and every night out on the decking with a glass of wine, grapes hanging above your head, patio heater on, sat back in comfy chairs, just felt like your own piece heaven out there. Big thanks to Roger and Debbie , very genuine down to earth people, nothing is too much trouble, who made us feel so welcome . We will all be back. We had a fantastic stay at Meadowview Cottage. The attention to detail inside and out is astonishing. Roger - you are a perfectionist. We enjoyed every aspect ; from watching the Olympics on the massive TV, to dining outside overlooking the sheep, to relaxing in the sauna after a long day out, to sitting as a family outside till late in the walled garden playing charades. And after all that, we were so pleased to retire to such a comfortable and spacious bed at the end of the day. Have continued to sleep so well by changing ours at home to the very same! Very suitable for our family of 2 adults, 3 teenagers & a little dog. We have just returned from a wonderful relaxing week at Meadowview cottage. 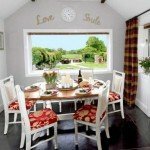 The cottage is furnished to a high standard with some wonderful personal touches. It's in a very peaceful location and a convienent base to explore northern cornwall. Debbie and Roger gave us a lovely warm welcome and made us feel very much at home. The garden and courtyard is an added bonus as is the play area for those with children. This is a perfect place for couples and families that are looking for an enjoyable and relaxing break away. We cannot recomend it highly enough and will definitely be back to stay again. A lovely, relaxing and beautifully presented property. Debbie and Roger have really thought of everything. Great for young families. We had some beautiful nights spent out on the decking in the walled garden. No hesitation in going back if in the area again. A very warm welcome awaited us when we arrived at Meadowview and it truly was the start of a wonderful weeks stay. Everything has been thought of to make your holiday easy when you have children. They will never be short of something to play with or an adventure to be had. Our daughter loved having the freedom to play and be independent. The chickens were visited regularly as were the sheep! The cottage is immaculate and brilliantly organised, it is the perfect place to enjoy a week away from it all. Thanks Debbie and family for being so nice and welcoming, we will be back. Simply perfect. Great location, stunning surroundings and a very warm welcome. All the comforts of home but with the added luxury. Thank you so much Debbie and Rodger for making our stay so lovely. Perfect location for Cornish countryside quiet but close enough for all major sights and attractions. Deb & Rog have thought of everything to make your stay stress free and home from home feel. We've stayed twice now and cannot fault it. Not even the weather spoils our stay. From the warm welcome with freshly homemade scones (delicious - Deb please email me your recipe!!) to the beautiful countrywide for those long walks and the sauna to relax in at the end of your day. Thank you again. We will be back very soon. Thank you Debbie and Roger for a wonderful week in your stunning cottage. It is the best cottage holiday we have had. Really luxurious with everything we needed. The cottage is secluded and in a brilliant location for exploring Cornwall. We had a fab time.